Biotechnology Calendar, Inc. would like to congratulate Jennifer Souvignier of R&D Systems for winning the 5 Star Program Award at our 14th Annual University of Alabama life science marketing event. At the end of each of our trade shows, Biotechnology Calendar, Inc. selects a Five Star Winner based on the representative’s professionalism and excellent sales demeanor when engaging with attendees. Five Star Winners at our events generally draw large crowds of researchers to their exhibit booths, converse individually with researchers about their lab supply needs and are friendly and outgoing through to the end of each event. Jennifer and R&D Systems were selected from 28 exhibiting companies at this year’s University of Alabama life science marketing event. R&D Systems is based out of Minneapolis and specializes in the production of proteins, antibodies, ELISA kits, stem cell and cell culture products as well as other reagents for cell biology research. They recently extended their portfolio with the addition of Tocris Biosciences (small molecules, inhibitors, neurotransmitters) and Boston Biochem (leading supplier of tools for Ubiquitin research). In an interview with our blog staff, Jennifer said that she made quite a few valuable customer contacts at our University of Alabama life science marketing event and handed out her business card to a number of attendees with whom she talked. When asked what the most valuable asset Biotechnology Calendar, Inc. provides at each event, she said she was looking forward to receiving the leads list. 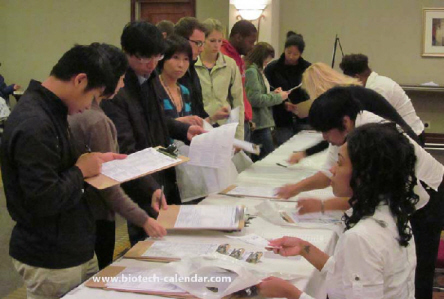 For readers not familiar with this option, leads lists provide the contact information for each registered attendee at Biotechnology Calendar, Inc. life science marketing events. They are checked, then double-checked for accuracy. This year’s University of Alabama life science marketing event was a success in terms of attendance. The event drew a crowd of 326 attendees. Our expected attendance rate matched nearly perfectly for this event, as we expected 325 people to attend. Of the visitors to the University of Alabama event, 87 were professors, post-docs and purchasing agents, and 58 were lab managers. The balance was research associates and postgraduate students. In her interview, Jennifer said that it’s sometimes a challenge to bring customers through the door at an event like this one. However, she also said that this event was busy according to her standards. It was so busy, she said, that one of the challenges she faced was finding time to eat lunch. Needless to say, the prospect of a delicious lunch draws large crowds of attendees, though we hope exhibitors are able to find time to enjoy lunch as well. Jennifer also complimented the event staff at our University of Alabama trade show, who were available to direct attendees to exhibitors selling specific products and services, and said that the event layout made every table accessible. Everything went smoothly for the event staff as far as helping exhibitors unload materials, paying for exhibitors’ parking expenses, and helping exhibitors bring materials to their cars. When asked about receiving recognition for her work, Jennifer said she appreciates that our 5 Star Award has reflected her professionalism at the University of Alabama event. Jennifer said she strives to be a professional in every aspect of her life, and that in itself is also a measurement of success. Congratulations once again, Jennifer! Thank you for exhibiting with us, and we hope to see you again soon.